The global lubricants market was valued at US$ 125.66 Bn in 2017 and is anticipated to expand at a CAGR of 2.9% from 2018 to 2026, according to a new report titled ‘Lubricants Market: Global Industry Analysis, Size, Share, Growth, Trends, and Forecast, 2018–2026,’ published by Transparency Market Research (TMR) The global lubricants market is driven by the rise in demand for synthetic lubricants across the globe. Asia Pacific accounts for major share of the global lubricants market due to rapid industrialization and increase in demand for small and fuel-efficient passenger vehicles. Synthetic oil lubricants include API group III-based products. Demand for synthetic passenger car motor oils (PCMO) is high in mature economies, such as the U.S. and Europe, due to the increase in demand for premium vehicles; growth in demand for extended oil drain intervals (ODIs); and improved fuel economy, lower vehicle emissions, and hardware compatibility offered by synthetic oil lubricants. Governments of countries in Europe and North America are pushing OEMs to create more energy saving and environment-friendly equipment, thereby boosting the demand for more powerful and reliable equipment among consumers. Certain OEMs have introduced technological advances in equipment design by creating lighter engines with power trains with 10-speeds or more and much higher power density. This equipment with advanced design require special purpose lubricants, which further enable these new engines, power trains, and equipment to operate at their peak efficiency. Many OEMs are working with lubricant manufacturers to come up with tailor-made products for new designs. Synthetic base stocks, such as PAO, provide excellent oxidative stability and low-temperature performance. These factors are estimated to boost the demand for synthetic oil lubricants during the forecast period. Asia Pacific has become the hub of the automotive industry in the last few years. Increase in demand for automobiles in emerging countries such as China and India is driving the automobile industry, thereby augmenting the need for lubricants. Rapid global industrialization is boosting the manufacturing sector and purchasing power of consumers. The middle class can afford to lead a better lifestyle. Thus, manufacturers of lubricants are striving to improve the quality of their products to meet the demands of various end-use industries. Demand for food grade industrial lubricants in the food processing industry is estimated to rise significantly during the forecast period. This can be primarily ascribed to the shift in demand toward automatic lubrication systems and automated factories. The food processing industry prefers automatic lubrication systems, as they keep the required components lubricated at regular intervals. The global wind turbine industry has been expanding significantly. Wind turbines and their components are exposed to various climatic conditions and high loads. Constant changes in high loads, varying operating conditions, and vibrations require tough equipment. There is a need for industrial lubricants, which can resist high loads and offer long service life over a wide range temperatures. Several economic factors, such as overproduction of crude oil, changing energy norms of countries, and economic meltdown across Europe and North America have led to a steep decline in oil prices. These factors have created volatility in demand for lubricants and their prices. Thus, oil companies need to adopt flexible strategies in the ever-changing market conditions amid intense competition. Demand for synthetic lubricants is high in North America and Europe due to the regulatory implications regarding vehicles and high customer demand. This is not the case in developing economies, where a majority of consumers prefer affordability of lubricants over their quality. This adversely affects the demand for synthetic lubricants in the automotive lubricants market. 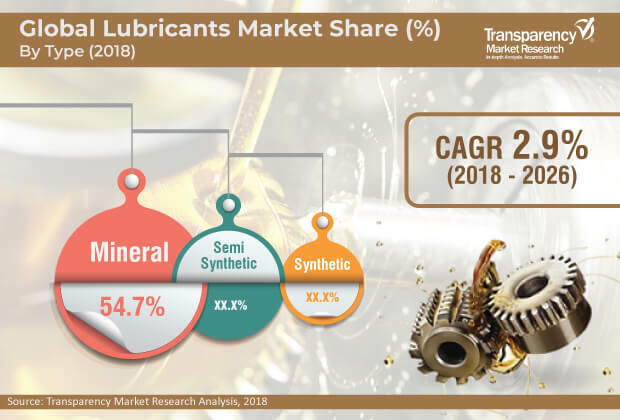 However, the overall lubricants market is not significantly affected, since mineral oil-based lubricants account for major share of the market. The global lubricants market has been segmented based on type, product, application, and region. Based on product, the market has been divided into automotive oils, industrial oils, metalworking fluids, hydraulic oils, process oils, marine oils, and grease & others. The automotive oils segment has been split into engine oils and transmission oils. The automotive oils segment dominated the global lubricants market in 2017. The automotive industry has been expanding since the last few years in terms of manufacturing process, materials, and geometries. The industry is focusing on meeting the requirements of increased mileage and lower emissions. Significant expansion of the automotive industry is propelling the demand for lubricants. In terms of region, Asia Pacific held the major share of the global lubricants market in 2017. Growth of the automotive industry and rise in usage of lubricants in the industrial sector are estimated to drive the market in the region during the forecast period. China, India, and ASEAN offer growth opportunities to the lubricants market in Asia Pacific. Rise in household incomes, urbanization, and foreign direct investments in various end-user industries, such as automotive and food & beverages, is driving the demand for lubricants in Asia Pacific. The lubricants market in Europe and North America is expected to expand at a moderate pace during the forecast period. Implementation of stringent regulations on emissions and increase in governmental pressure on OEMs to manufacture fuel efficient engines are augmenting the market in these regions. The automotive oils segment of the lubricants market in Middle East & Africa is projected to expand at a stable pace during the forecast period. Developments in the automotive sector in the region and consistent investments in new projects made by government and private entities are projected to drive the segment in the next few years. Tax incentives and government subsidies for the purchase of fuel-efficient automobiles in Latin America are encouraging domestic manufacturers to opt for quality lubricants. Key players profiled in the report include Royal Dutch Shell Plc., Calumet Specialty Products Partners, L.P, PetroChina Company Limited, Total Group, China Petrochemical Corporation (Sinopec Group), JXTG Nippon Oil & Energy Corporation, Idemitsu Kosan Co., Ltd., FUCHS, Gulf Oil Marine Ltd., BP plc., Petroliam Nasional Berhad (PETRONAS), Chevron Corporation, and ExxonMobil Corporation.